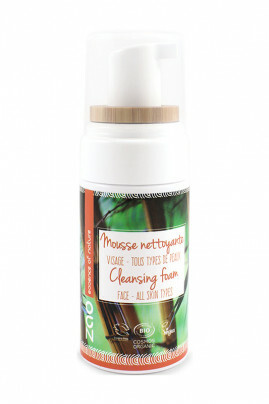 ZAO Organic Foaming Cleanser gently cleanses and purifies your skin. Its light texture with its delicate fragrance transforms into a fine and ethereal foam for the pleasure of a gentle, soap-free cleansing. The combined action of lemon balm and blueberry hydrolates and aloe vera powder takes care of your skin. With ZAO Vegan Cleansing Foam, your skin is perfectly cleansed and toned! ZAO Vegan Cleansing Foam Cream is soft for your skin! On slightly damp face, apply a little cleansing foam to the entire face using circular movements. Rinse with lukewarm water. A 100% natural composition in ZAO Vegan Cleansing Foam ! 31% OF THE TOTAL INGREDIENTS ARE FROM ORGANIC FARMING AND 100% OF THE TOTAL IS OF NATURAL ORIGIN. Organic lemon balm water (Melisse officinalis flower / leaf / stem water): Revitalizing, soothing and softening active ingredient, it is perfect for mature, dry and irritated skin as well as for skin with imperfections. Organic bamboo hydrolat (Bambusa vulgaris leaf extract): rich in organic silica, organic bamboo hydrolat is known for its moisturizing and regenerating properties. This external supply is necessary to maintain the elasticity of the tissues and skin. Aloe barbadensis leaf juice powder: The calming and regenerating properties of aloe vera powder provide all the softness necessary for a beautiful skin.